The live seismos are showing a global quake each day at the same time (8:00 UTC)! This occurred on the last [four] consecutive days from December 19- like clockwork. We're being hammered! I note that in measurements from Madrid, Spain the placement of the Sun at sunrise seems on target but at sunset the Sun appears to be way North! This is the European lean with a vengeance! As the N Pole of Earth leans to the left, those gazing at the sunset from Europe see the Sun in a more northerly position because the equator has dipped down to point toward the south. On Dec 19, 2007: Early this morning, I checked the compasses and they were steady at 58° West of North. Just now, noon here in Pennsylvania, they moved dramatically to 24° East of North. Another major wobble because I have never seen the compasses move this much in such a short time! In 2004 the pattern in global quakes was for them to occur at 0:00 UTC or 12:00 UTC when Greenwich mean time is either at midnight or high noon. 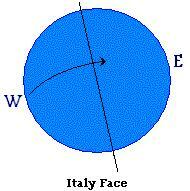 This coincides with the Atlantic Rift either facing the sun or in opposition on the other side of the globe. In 2004 the global quakes and the wobble which ensued were driven by the interaction between the S Pole of Planet X and the Earth, as the S Pole of Planet X was pointing toward the Earth. In time this changed as Planet X has turned in place so that it is now pointing its N Pole out toward Earth. The wobble has consequently become more severe because the interaction between Planet X and the Earth is driven by a N Pole push. Each day, when the Earth's magnetic N Pole comes over the horizon so that it is facing the Sun and the bully magnet Planet X, the Earth receives a shove from Planet X, pushing her magnetic N Pole away. This occurs at approximately 8:00 UTC, the point at which the European lean occurs during the daily wobble. The European lean was formerly gentle but now has become almost violent, as the N Pole of Planet X is pointing more directly at Earth. Imagine what happens when the globe suddenly tips sideways toward the west and backwards to shield its magnetic N Pole from Planet X. Water in the northern Atlantic is pushed eastward, over land, the cause of the high tides the Essex coastline of Britain experienced recently from the trapped waters in the North Sea. As this is a global event, Indonesia likewise experienced a high tide during that same moment, as the land masses in southeast Asia were pushed over the water trapped by the many islands in that vicinity. What does this increasingly violent daily lurch do to the Earth's plates, which have loosened up and become more fluid lately due to being subjected to the constant jerking of the wobble? Great quakes that affect the globe in its entirety must first occur at one of the brake points in the global mesh of plates. For the Earth, this is primarily the point where the Indo-Australian plate dives under the Himalayas. The Himalayas, the highest mountains in the world, show how often this brake point has been hammered in the past. When this brake point moves, it allows the many compression points in the great Pacific to move. This includes rolling the top portion of S America westward, putting a bowing stress on its long west coast region centered in particular around Santiago, Chile - the site of so many quakes lately. This also includes allowing the N American continent to move westward, but as this continent is locked at the top border with Russia, this movement manifests as a diagonal rip, the New Madrid fault line adjustment we have predicted. Mexico moves further west than the Canadian west coast, accentuating the bowing of the west coast we have described. As this occurs, the regions west of the Mississippi River are pulled down and to the west, moving toward the southwest, while the regions to the east of the Mississippi River tend to remain in place. This tears the bridges crossing the Mississippi and allows land already sinking to sink further. Elsewhere around the world such a strong adjustment creates an opening in the Indian Ocean, which allows Africa to roll toward the void, opening the African Rift further. This also puts pressure on the Arabian Plate, so that it rolls in place, a move which affects all the many fault lines that run through this region. A major adjustment of this type unleashes a series of great quakes, which then subside, as the Earth plates lock into new brake points and hold. Nevertheless, for the inhabitants of planet Earth, this would be a wakeup call, as such quakes are not caused by Global Warming but by the intruder Planet X, so much denied in the media. The cover-up over Planet X is alive and well, but would be dealt a death blow by such a round of global quakes.